The CS-5000 consists of a receiver, a transmitter, and accessories for connecting the transmitter to the circuit being traced or identified. The receiver features a front facing LED linear array display, over-molded grip design and a lifetime limited warranty. The dual notification, audial and visual, allows the operator to perform tasks in a variety of different environments. The CS-5000 also has an auto power-off function to maximize battery life. The multi-functional CS-5000 Circuit Seeker provides the electrical contractor with proven technology for both circuit tracing and panel breaker locating. 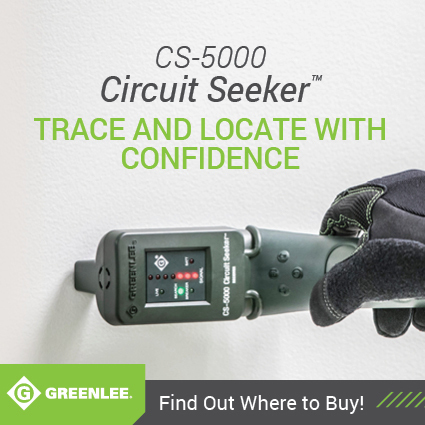 The CS-5000 Circuit Seeker identifies and traces either live or de-energized circuits. It locates faults in a circuit and identifies specific circuit breakers. Greenlee® is increasing the versatility of the EK628/EK425 Gator tool models by adding two new cutting jaws to the line. Both sets of jaws are compatible with the “X” and “L” Series Gator tool line. The ESC50LX is a 2” inline tool with cutting capacity up to 2” diameter copper and aluminum standard and fine stranded cable, eliminating the need for multiple tools. The ergonomically designed, lightweight, well-balanced cutter has a long tool reach, which can reduce operator fatigue and overextension of the arm. The Professional Tool Backpack (0158-26) is part of the innovative Next Generation tool bag line, which are engineered to reduce strain on the user and withstand wear and tear. In addition, the back pack allows for customization with a personalized name patch.